BMC Imports' "The Jewel of Russia" preserves the authentic character of traditional Russian vodka. Russian hard winter wheat and rye, and pure artesian water are used in creating a full-bodied yet silky smooth premium vodka. The "Classic" brand is encased in a bottle that is copied from a 300-year-old design and marked with a hand-applied red wax emblem in Russian and a hand-dipped protective wax seal. The suggested retail price is $28.95. The "Ultra" limited edition brand's bottle is unique. 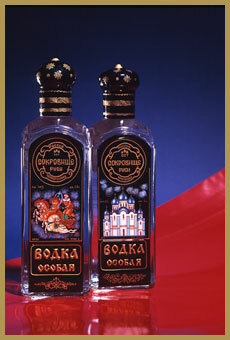 A traditional Russian hand-painted lacquer miniature is painted directly on the bottle by Russian artists. The bottles are numbered and less than 2,000 of them will be available each month to the U.S. market. The bottles will become a collector's item since the traditional scenes will be changed twice a year. The suggested retail price for the Ultra brand is $49.95.